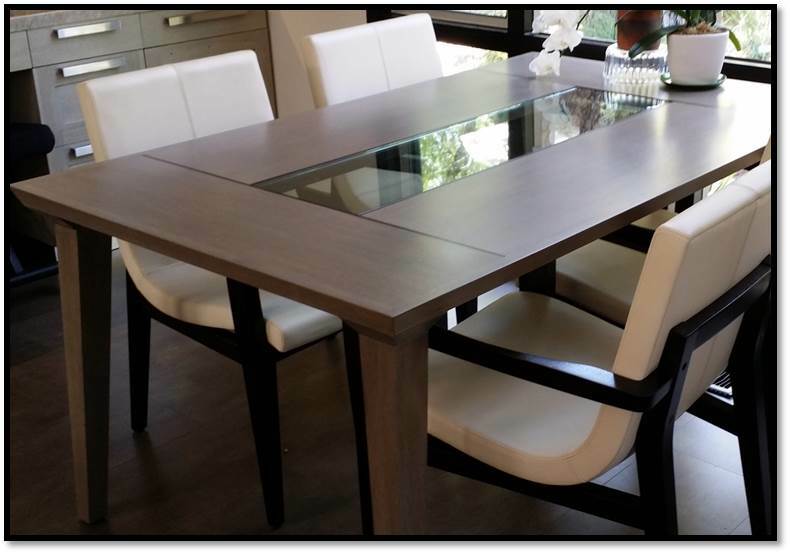 As a finishing touch to a kitchen remodel for very special clients, I designed a custom breakfast table for their new kitchen. For a very sophisticated look, I used rift sawn oak for the kitchen cabinets which has a beautiful even linear grain. I wanted to use the same material for the table. Rift sawn oak is the most dimensionally stable cut of wood available and is perfect for the daily use in a breakfast area. The table is complimented by four leather upholstered chairs from Holly Hunt. 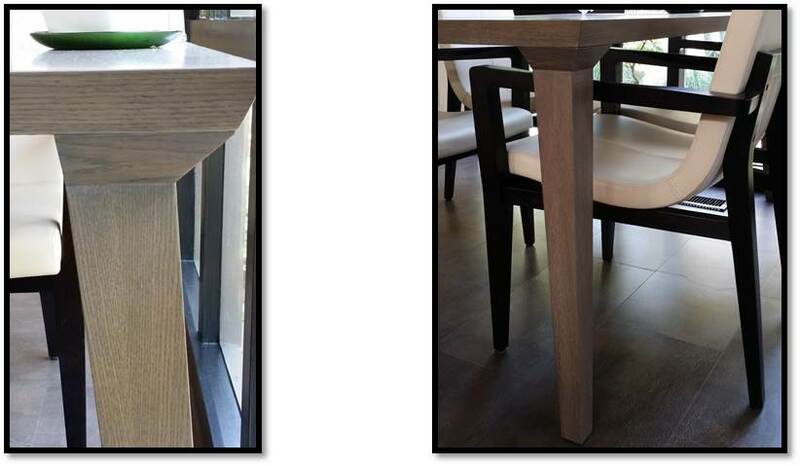 The subtle angles used in the construction of the chairs are a perfect counterpart to the table. To take it a step further, I had the oak bleached by my finishers to eliminate the yellow or orange tones that come up when oak is stained. I wanted the finished color to be a warm tone of taupe. For contrast, I added a thin inlay of Wenge wood stained in an espresso brown. I wanted an updated “retro” look. My goal was for the table to possess clean, slightly angled lines. 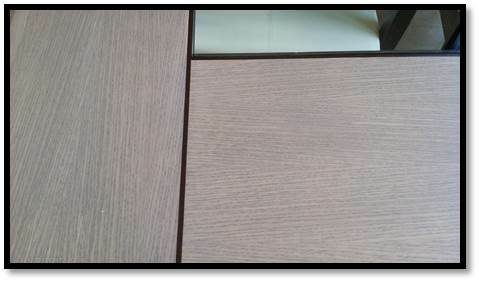 The edges of the tabletop slightly angle downward and inward. 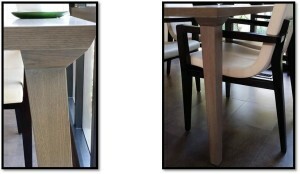 The legs do the same and are carefully designed so they don’t exceed the perimeter of the tabletop. 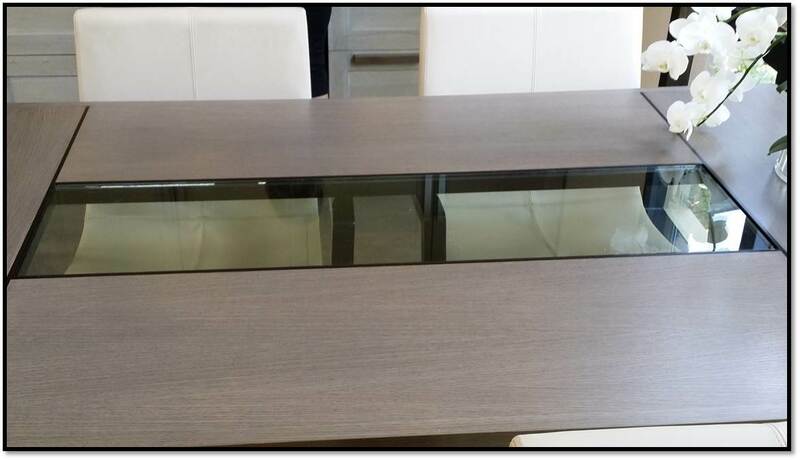 I designed the top of the table with a clear glass inset for a couple of reasons. Visually, I wanted the table to have a lighter feel and not look too heavy in a limited space. 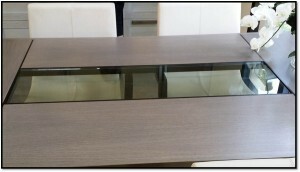 The table sits perpendicular to a large glass window overlooking a garden and the glass reflects some of the plant forms from the outside. My client has one of the most mature California Native Plant gardens in Los Angeles, so she was thrilled with the overall design!